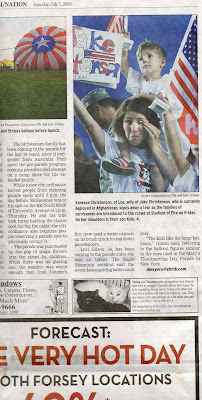 that of course my 5 minutes of fame has to be a picture like this in the salt lake tribune...i had heard that i was in the newspaper...and when i saw it i was like "of course" and then i was happy that no one i knew in my small town would be seeing this but sure enough as i drove into my driveway my neighbor across the street yells "heard you were in the paper" and then as i walk up to my front porch under a rock was this picture just for me. Ok don't hate me, you know I love you but I laughed out loud when I saw that picture. Was it a tear? Probably not. Kyle probably kicked you in the eye as we ran as fast as we could across the stadium. it's okay, the pictures I have of us are HOT! Your little Nate is so cute-while we were waiting to go in he saw our soldiers, tugged on my shirt and said "do you think those are OUR army guys" followed by "could I tell them good job military"? Aw, Vanessa! Darn it! I'm positive that there were a million of you that were perfectly darling. I think that reporter is mean! I saw his email address on the bottom....should we all flood him with emails and make him post a flashy, cute pic?! How do I know those exist? Because that is what ALL the pics of you are like! The irony made me laugh out loud! I think the picture is genuine and real and that is what I like about it. Congrats on being in the paper - that is so cool. I know Jacob is proud of you and the kids for showing your support of him and everyone serving our country! ahhhh! Your first tabloid shot! It's ok we know you're a hot mama! Vanessa, Jen and I had a really good laugh, which we needed over this picture. Honestly you are such a beautiful girl I cannot imagine why they would have put it in...but you can always crop it as Kyle next to the flag would be a great photo. 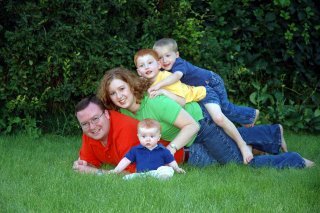 It is a touching photo and we apprecaite the scarifice of your family so much. Thank you Jake! And hey, no one looks good when they are moved to tears...so it's all good, really! Dear dear!!! Actually after I had a good laugh - I totally cried!!! What an awesome experience for you. My friend went to the show and when she told me how you guys walked out, I just cried. Thank you for being brave and giving up Jake for a while! Love ya!!! Yeah, I was fine until my husband saw it and said, "Aw, she's crying." and then I lost it. Thanks Jake, for all you do. We are praying for you.